When a book is called a "novel of ideas," I get suspicious. Too often, what that really means is pretentious and obscure. In this case, though, "novel of ideas" means a terrific story married to thought-provoking notions. There's a lot going on in this book. At the simple plot level, it's a fast-paced thriller in which a small army of "poets" chases renegade compatriot, Emily Ruff (a/k/a Woolf ), from multiple US locations to the sun-blasted wasteland of Broken Hill, Australia. At the conceptual level, Lexicon is about the power of words, both literally and figuratively. A secret, unnamed organization recruits people who are already talented at persuasion and gives them intensive schooling in personality analysis, neurolinguistics, logic and rhetoric. The goal for the "poets" is to learn command words that work to "compromise" (i.e., control) each of 218 personality types, or "segments." As if that's not alarming enough, the organization's head, Yeats, contends that there is a language of "barewords;" a single language with a lexicon so powerful it can control all personality types. What could go wrong there, right? Emily Ruff is our guide to all this. Her last name is "Ruff" for a reason. She starts out as a street person in San Francisco, eking out a bare living running a three-card monte game for a handler. She's scruffy and uneducated, but with a quick intelligence and an instinct for manipulation. Her experience with the organization, at its school, in the field and in the world, are a coming-of-age story, as she learns about love, power, self-preservation and free will. In a deeper layer, below the thriller plot and its high concept, Max Barry tells a cautionary tale of how the organization's techniques aren't so far-fetched in the real world today. Especially online, people allow so much data to be collected on them that they practically segment themselves. In political speak, there is "dog whistle" messaging; special code words taken at face value by the general population, but with a secret meaning for those in a certain political segment. The art of media persuasion is just as much about capturing the audience with rhetoric as with images. After reading Lexicon, you'll see the media differently--and you may never again take an online poll or personality test for fun. 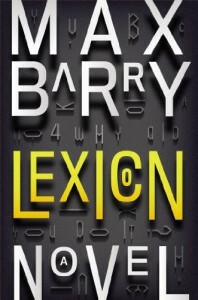 As usual, Max Barry's writing is fluid and natural, with just the right amount of subtle, but acerbic wit. Lexicon holds the current record for number of Post-It notes in my 2013 reading. Sometimes an entire page is notable, and other times I'm taken by a throwaway line like: "The man had red cheeks and was divorced, although he didn't know it yet."